My Grandma was a good cook. When I was very young we lived with her. She made her Irish Bread in her wood stove. Mary Agnes Kelly Anderson, was born May 28, 1877, in Dungarvan, Waterford County, Ireland1. Mary Agnes told me that, when she was a child, Ireland was under British rule and the Irish were not allowed to speak Gaelic. She knew all her prayers in Gaelic. She knew Irish proverbs and curse words in Gaelic, which she taught me when I was 4 and 5 years old. She also told me all the stories of the leprachauns, the Banshee, and other Irish legends. She claimed to have seen leprachauns under fences and the Banshee "sitting on a fence combing her long hair". The oldest of a large family, Mary Agnes Mary Agnes arrived in New York October 18, 1895. According to the ship's manifest, Mary Agnes was 18 years old, Irish, and single. She traveled alone in steerage class with one bag. She could read and write. Her occupation was "servant" and she was coming to America for a "Prolonged Sojourn". She never saw Ireland again. When she arrived in New York, she saw mattresses out on the fire escapes and thought "This is America?" She had expected more. She told me that life in the tenements of New York was hard. One problem was the cockroaches which were impossible to control. Everyone slept with the legs of their beds sitting in small dishes of kerosene because otherwise they would be invaded by bedbugs. Brothers Mike, Ed and John came to America with money Mary Agnes sent them for passage. Ed and John died young. Ed had two children, Helen and Jack, both of whom, never married. Mike and his wife Katie died of heart disease late in life. In Ireland, were sisters Bridget, Katie, Nano, and brother Joe. Katie married an Englishman. Around 1946, Mary Agnes told me the story of her ungrateful sister. Katie kept the money Mary Agnes sent her for passage to America. She never even wrote to say thank you. Even worse, she had run off and married an Englishman. Mary Agnes never forgot this rude betrayal, especially that she had married an Englishman. Mary Agnes arrived in New York October 18, 1895, on the ship Germanic on which she embarked at Queenstown, a port not too far from Waterford. According to the ship's manifest, Mary Agnes was 18 years old, Irish, and single. She traveled alone in steerage class with one bag. She could read and write. Her occupation was "servant" and she was coming to America for a "Prolonged Sojourn". She never saw Ireland again. When she arrived in New York, she saw mattresses out on the fire escapes and thought "This is America?" 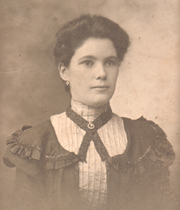 Mary Agnes Kelly worked as a live-in domestic at the home of Alfred B. Price at 53 West 90th Street in Manhattan. She had expected more. She told me that life in the tenements of New York was hard. One problem was the cockroaches which were impossible to control. Everyone slept with the legs of their beds sitting in small dishes of kerosene because otherwise they would be invaded by bedbugs. According to the 1900 Census, Mary Agnes Kelly was employed as a live-in domestic by Alfred B. Price at 53 West 90th Street in Manhattan. She was 23 years old. In 1942, Mary Agnes got a copy of this census record, most probably to work at the Torpedo Factory on Goat Island in Newport. Mary Agnes appears to have moved shortly after the 1900 census. Among the papers of Mary Agnes' grandson, Johnnie, there is a letter to Mary Kelly, postmarked November 26, 1900, Tomkinson SC, from William Sanfmann of the USS Kearsarge. William was a boyfriend. He wrote her a poem. According to the New York 1910 Census, Mary Agnes Kelly Anderson, 31, was living in Brooklyn at 213 McDougal Street with sons John 2, Andrew 6 mos, brother Michael (1885-1947) 25. Her brother John (1887-1953) 23, lived next door. John's wife was Bridget and he worked in the sugar factory. According to her daughter Marie, two of Mary Agnes' brothers worked for Arbuckle sugar refinery. I believe two of them died in accidents at work. One of them, who fell into a vat, was singing "It's a Long Way to Tipperary" on his death bed. Mary Agnes and Axel were living in Brooklyn at 213 McDougal Street until 1908; by 1912 they were at 903 Dean Street5. 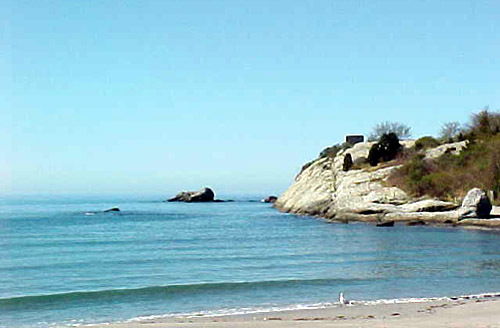 We know from the 1920 census that sometime before 1920, they moved to Newport, Rhode Island. John and Andrew were born in New York; Marie was born in Newport. They lived first at 675 Thames Street, then moved up the street to 700 Thames. Daughter Marie who was very close to both her parents said that they had a very happy family life when she was growing up. Her brothers died in New York. Michael Kelly (1885-1947) died August 27, 1947; John P. Kelly died July 6, 1953. I do not know when her brother Edward died. Her niece Helen lived in East Rockaway at least the early 1970's. Her daughter Marie used to visit her. Mary Agnes Kelly Anderson was the only member of her family to settle in Newport Rhode Island. The siblings she brought over all stayed in New York. My family used to visit these relatives in New York. At first they lived in Brooklyn, but then they moved to East Rockaway. Pictured left outside their East Rockaway town house are Kellys. 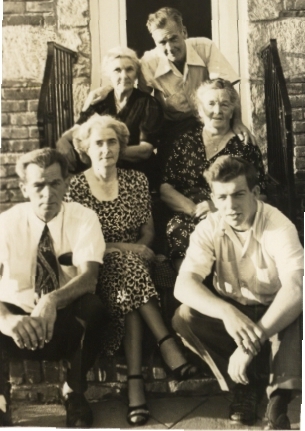 Top left is Mary Agnes with one of her brothers. I believe Ed. To the right is his wife, probably named Kate. To the left of her is Helen who never married. One of the two men in front is Jack, Helen's brother, who also never married. The picture was taken on September 17, 1950 probably soon after the family moved from Brooklyn to East Rockaway. Mary Agnes died suddenly of a heart attack less than two years later in July 1952. 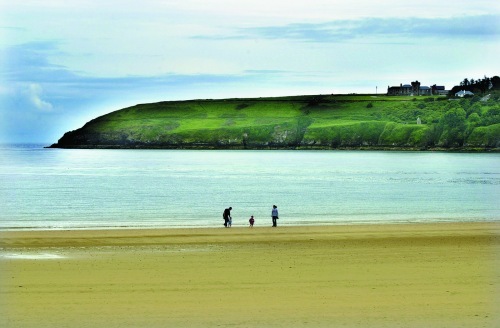 Ardmore Beach Ardmore, a historic seaside village 14 miles southwest of Dungarvan, is the site of a 7th-century monastic settlement founded by St. Declan.